To Cite: Mahvi A H, Vosoughi M, Mohammadi M J, Asadi A, Hashemzadeh B, et al. Sodium Dodecyl Sulfate Modified-Zeolite as a Promising Adsorbent for the Removal of Natural Organic Matter From Aqueous Environments, Health Scope. 2016 ; 5(1):e29966. doi: 10.17795/jhealthscope-29966. Background: High concentrations of natural organic matter (NOM) may cause the production of harmful compounds in treated drinking water. Surfactant-modified zeolites (SMZs) with various loadings of sodium dodecyl sulfate (SDS) have been used as adsorbents to remove NOM from aqueous solution. SMZ has presented higher NOM adsorption more efficiency than natural zeolite. NOM affects the quality of drinking water in several points. Objectives: The purpose this study was to investigate the SDS-modified isotherm of natural Iranian zeolite obtained from Semnan mines, for the removal of NOM from aqueous solution. Materials and Methods: The adsorption of NOM onto SDS-modified zeolite as a function of contact time, initial NOM concentrations, adsorbent dose and solution pH was investigated. The isotherm experiments were carried out with fixing the adsorbent dose and varying the initial concentration of NOM. Results: The results indicated that SDS-modified zeolite showed greatly enhanced adsorption capacity. Findings revealed that the Langmuir isotherm best described the NOM adsorption on the adsorbent. The adsorption isotherm was well fitted to the Langmuir model. The maximum adsorption capacity of SMZ with surfactant bilayer coverage for NOM was 111 mg/g at 25°C and pH = 5. Conclusions: The findings of this study showed that the modification of natural zeolites can achieve higher adsorption capacity for organics. In addition, based on the results, natural zeolite being modified with SDS as a cationic surfactant had good efficiency for the adsorption of NOM. Humic compounds are considered as the biggest portion of natural organic matter (NOM), found in many surface water sources (1-3). NOM is one of the main components of organic matter, which is form the major portion of dissolved organic materials. NOM components are anionic molecules with surface functional carboxylic and phenolic groups (2, 4-6). High concentrations of NOM may produce harmful compounds in treated drinking water. The presence of NOM in raw water sources is unfavorable and has long been a problem for water supply system industries. Particularly, NOM affects the quality of drinking water in several points. Color is an important esthetic drinking water quality (7-9). In addition, NOM can bind synthetic organic pollutants (such as pesticides) and heavy metals and results in their transportation through the treatment units and distribution network (5, 10-12). Furthermore, as a matter of the presence of high concentrations of NOM in raw water, chlorination of raw water can result in the production of disinfection by-products (DBPS) such as trihalomethanes (THMS) during the chlorination process (1, 5, 10). Therefore, the removal of NOM from drinking water resources is so important. There are various methods for the removal of NOM from raw water such as membrane processes (nanofilters and reverse osmosis), chemical coagulation and precipitation, advanced oxidation, and adsorption (11-15). Among the above processes, adsorption is the most applicable and acceptable method. Many different adsorbents including activated carbon, resin, unburned carbon, chitosan, and surfactant-modified bentonite have been applied for synthetic humic acid (HA) removal (10, 16-18). Marc Edwards’ study showed that strongly acidic groups are predicted to be the key to the formation of strong surface complexes between organic molecules and oxide surfaces (19). Qunhui Zhou et al. studied the adsorption equilibrium and kinetics of an aquatic fulvic acid (XAD-8 resin extract) onto goethite (α-FeOOH) (20). Chunli Ding examined the mechanisms controlling the adsorption of NOM on surfactant-modified iron oxide-coated sand (21). In recent years, natural zeolites have been studied for the removal of various pollutants from water and wastewater. Natural zeolites are hydrated aluminosilicate with structures of tetrahedrons SiO4 and AlO4 including water molecules, alkali and alkaline earth metals in their structures (1, 22). In this regard, natural zeolites can generally exchange cations with anions, making them appropriate for surface modification by cationic surfactant (3, 10). Cationic surfactant comprising positive groups can readily exchange its groups with the exchangeable cations on the external surface of zeolite, which results in improving the adsorption capacity (1, 23). To our knowledge, no studies have been performed in relation to NOM sorption on modified zeolite by sodium dodecyl sulfate (SDS). Furthermore, zeolites from different sources have different characteristics, which can affect their adsorption potentials. This study aimed to assess the efficiency of the SDS-modified isotherm of natural Iranian zeolite obtained from Semnan mines, for the removal of NOM from aqueous solutions for the first time. Natural zeolite was purchased from Afrazand Co. Ltd. The surface morphology of the zeolite was analyzed using scanning electron microscopy (SEM) (XL30 Philips, Holland). X-ray fractionation (XRF) (PW 2404 Philips, Holland) and X-ray diffraction (XRD) (Philips-XPERT) techniques were used to analyze the chemical composition of the zeolite samples, respectively. The NOM sodium salt was obtained from Sigma-Aldrich company. SDS was purchased from Merck company (Germany). The NOM solution samples were real and collected from Tehran Latiyan dam. Other chemicals used in this study were obtained from Merck. The zeolite tuff was ground and sieved by 0.21 - 0.3 mm American Standard Test Sieve Series (ASTM). The milled zeolitic tuff was washed for several times to remove inorganic impurities; then, for dissolution of salts, the zeolite tuff was completely soaked in deionized water for 24 hours. To eliminate organic materials in the zeolite, it was then dried at temperature above 100°C in an oven for 24 hours (24, 25). Before the modification of the zeolite surface with the surfactant, to make monotonous adsorption sites on the zeolite surface with sodium, 10 g of zeolite was added to each conical flask containing 100 mL sodium chloride solution of 2 M concentration. Then, the conical flasks were shaken by an incubator shaker (150 rpm; 20°C) for 24 hours (24, 26). To prevent the possible intervention of chloride anions in the modification of zeolite, samples were washed several times with distilled water to remove the remaining chloride. The residual chloride in the supernatant of the premodified samples was determined by AgNO3 using the argentometry method (27). Finally, the samples were dried in oven at 50°C for 24 hours (22). Zeolite surfactant modification can improve the adsorption capacity. A monolayer will be formed when the surfactant concentration is equal to or less than its critical micelle concentration (CMC). The surfactant molecules will form a bilayer of surfactant on the surface of zeolite if the surfactant concentration in a solution exceeds the CMC (28). The surfactant modification of zeolite makes a hydrophobic environmental conditions for the partitioning of the organic molecules with low polarity and high molecular weight (29). The CMC of SDS is 1.8 mmol/L (24, 26). To determine the effect of surfactant concentration on the adsorption of NOM, three initial concentrations of SDS surfactant (0.5, 1.8 and 20 mmol/L) were selected which were in lesser, equal, and higher concentrations than the CMC of the surfactant for modification. For the preparation of modified zeolite, 10 g of prepared cationic zeolite was put into a 200 mL conical flask containing 100 mL of different concentration of SDS (0.5, 1.8 and 20 mmol/L). Then, the flasks were shaken in an incubator shaker (20°C, 150 rpm) for 24 hours. The solid was washed with distilled water repeatedly until no Br- was detected by AgNO3 solution; then, it was dried in an oven at 50°C for 24 hours (24, 26). The zeolite modified with 0.5, 1.8 and 20 mmol/L of SDS solutions were named as surfactant-modified zeolites (SMZ) 1, SMZ2 and SMZ3, respectively. Where C0 and Ce are the initial and equilibrium liquid- phase concentrations of NOM, respectively (mg/L), V is the volume of the solution (L), and M is the weight of the used adsorbent (g) (30). The surface of the natural zeolite was observed using a SEM device (Figure 1). Left slide, before the modification; right slide, after the modification. The chemical compositions of the zeolite are given in Table 1. The cation exchange capacity (CEC) and external cation exchange capacity (ECEC) of the natural zeolite were determined to be 1.85 meq/g and 0.205 meq/g, respectively. The removal efficiencies of different types of modified zeolites are shown in Figure 2. 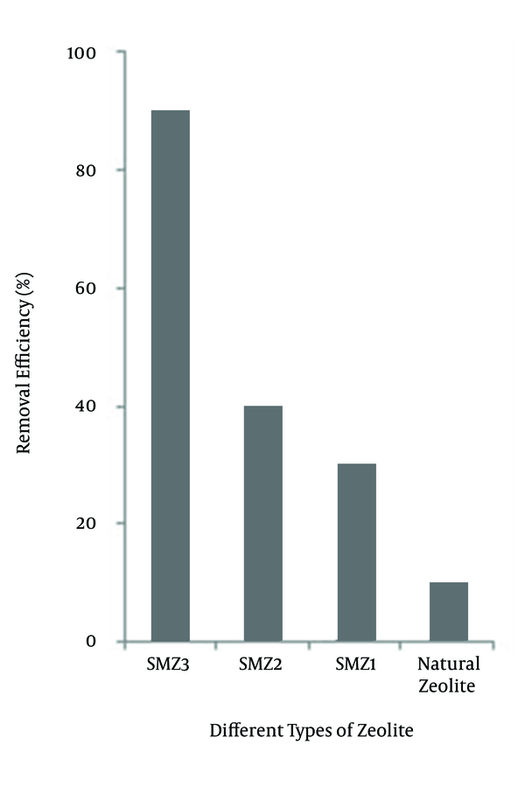 Figure 2 shows the SMZ3 in comparison with natural zeolite, SMZ1 and SMZ2, which has higher capacity to absorb NOM. Initial concentration = 10 mg/L, pH = 7, adsorbent dose = 0.8 g/L. The effect of pH on the removal of HA by SMZ is shown in Figure 3. It should be noted that the increase in negative charge of HA with increasing pH did not bring about an increase in HA adsorption at higher pH levels. Figure 4 presents the effect of adsorbent dose on NOM removal at different initial concentrations of NOM (5, 10, 20 and 50 mg/L). The experiments showed that with increase in the amount of the adsorbent dose from 0.2 to 1.2 g/L, the efficiency of NOM removal increased for all NOM concentrations. qe, the amount of adsorbed NOM onto SNZ3 at equilibrium; pH = 5 and t = 300 minutes. where Ce (mg/L) is the equilibrium concentration of NOM in solution, qe (mg/g) is the amount of adsorbed NOM onto SNZ3 at equilibrium, qm (mg/g) is the maximum adsorption capacity, and Kl (L/mg) is the Langmuir constant related to energy sorption; the plot of ce/qe against ce gives a straight line (Figure 5); the slope and intercept of this line correspond to qm and Kl, respectively (31). The calculated correlation coefficients (r2) and the Langmuir constant for NOM are presented in Table 2. Investigation of this table shows that the maximum NOM sorption capacity of SMZ3 (qm) and the r2 value were found 111.23 mg/g and 0.97 at 25°C, respectively. The r2 of Langmuir isotherm was greater than that of the Freundlich isotherm for the adsorption of NOM. This implies that the adsorption of NOM onto SMZ3 was better depicted by the Langmuir model than the Freundlich model. Where Kl (L/mg) is the Langmuir constant and C0 (mg/g) is the initial concentration of NOM. RL values between 0 and 1 indicate favorable adsorption. The adsorption process is irreversible when RL is 0, linear when RL is 1, and unfavorable when RL is greater than 1. 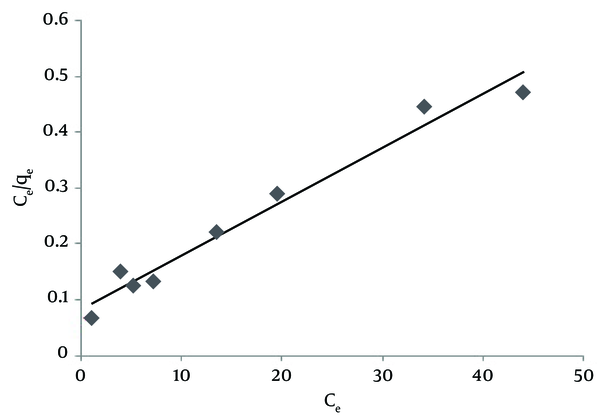 By calculating the RL values for examined adsorption system, values were found from 0.084 to 0.64 for NOM concentrations ranging from 5 to 100 mg/L at 25°C (Table 2). Accordingly, these values showed that the adsorption process was favorable. Where Ce (mg/L) is the equilibrium concentration of the adsorbate, qe (mg/g) is the amount of NOM adsorbed per unit mass of adsorbent, KF (mg/g) and n are Freundlich constants with n giving an indication of how favorable the adsorption process is and KF is the adsorption capacity of the adsorbent. 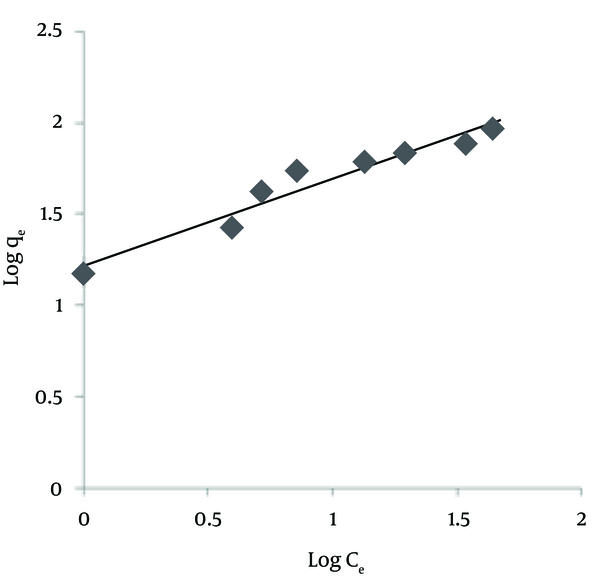 These constants can be determined from the linear plot of log qe versus log Ce (Figure 6). KF can be explained as the adsorption or distribution coefficient and represents the quantity of NOM adsorbed onto SMZ3 for a unit equilibrium concentration. The magnitude of the exponent, 1/n, gives an indication of the favorability of adsorption. Values of n > 1 represent favorable adsorption conditions (32). Values of KF and n are calculated from the intercept and slope of the plot, respectively, and are listed in Table 2. The results suggest that NOM was favorably adsorbed by ZMS3. However, the values of the correlation coefficient (r2) indicated that the Langmuir isotherm NOMs were best fitted for the adsorption of NOM on SMZ3 all abbreviation are presented in Table 3. During the recent decades, NOM has been found in many surface water sources. NOM is one of the main components of organic matter which form the major portion of dissolved organic materials. According to the results of this study, SMZ3 as the zeolite loaded with a surfactant concentration greater than CMC had a higher capacity to adsorb NOM; therefore, among the other types of adsorbents, SMZ3 was chosen as the best adsorbent and used for the next experiments. 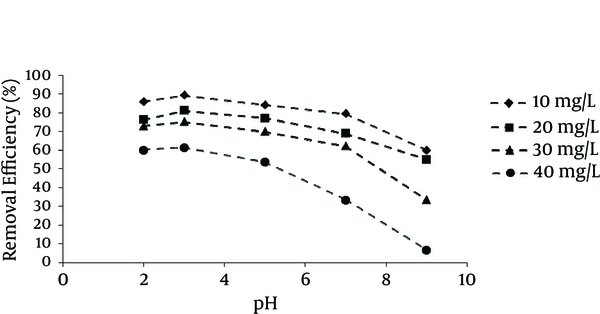 Based on the result of this study, NOM exhibited high adsorption at low pH and decreasing adsorption as pH increased. Other studies have presented similar results. Li et al. determined adsorbent levels in SMZ for the removal of HA from water and reported an increasing adsorption relationship with low pH (8). Based on the result of a study by Abate, pH and ionic strength were related to removal processes of a sedimentary HA in a suspension of vermiculite. They showed that low pH had an influence on adsorbent levels (33). In another case, Yan and Bai found an association of adsorption of lead and HA with chitosan hydrogel beads (34). The results indicated that similar behavior was observed for HA by chitosan adsorbents (34). According to the results obtained through other surveys and the present study, the investigation of the adsorption of bisphenol A by SMZ recommended that anionic species had greater affinity toward SMZ than neutral species due to the enhanced interaction between negatively charged bisphenol A anions and the positively charged head of hexadecyltrimethylammonium (HDTMA) (35). However, unlike bisphenol A, HA is a macromolecule that can possess a negative charge, even at pH levels as low as pH 3, due to the deprotonation of carboxylic groups, although a pH above around neutral is required to enable phenol groups to dissociate (35). Hence, HA behaves as a polyanion in water, unless the pH is extremely acidic. However, the negative charge of HA still increases with increasing pH, because the deprotonation of HA increases continuously with pH in the pH range analyzed. Although, a negatively charged organic molecule would have higher affinity to interact with the positively charged head of surfactant, similarly to bisphenol A. According to our results, the increase in negative charge of HA with increasing pH did not bring about an increase in HA adsorption at higher pH levels (Figure 3), suggesting that the influence of pH on HA adsorption by SMZ could barely be interpreted by ionization of the molecule. pH value is one of the most important parameters affecting adsorption behavior, because it also controls the adsorbent surface charge. Figure 4 illustrates the quantities of adsorbed NOM (mg/g) for different NOM concentrations decreased with increase in the adsorbent dose. 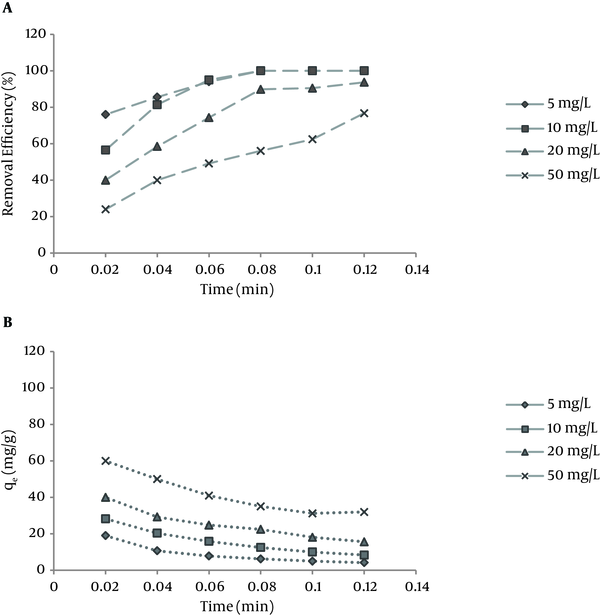 According to Figure 4, the amount of qe (mg/g) for initial concentration of 5 mg/L decreased from 19 to 4.1 mg/g, and for initial concentration of 50 mg/L it decreased from 60 to 32 mg/g with an increasing adsorbent dose from 0.2 to 1.2 g/L. Zhan et al. assessed the removal of HA from aqueous solution by cetylpyridinium bromide modified zeolite. Based on their results, adsorbed NOM concentrations decreased with increase in the adsorbent dose (23). In a similar work in 2010, Torabian et al. estimated the effect of surfactant-modified natural zeolite on removal of petroleum aromatic hydrocarbons (26). The result of this study is similar to our study (26). It is easily understood that the number of available adsorption sites increases by increasing the adsorbent dose, which results in the increased percentage of NOM removal. On the other hand, the experiments showed that the adsorption amount per mass unit (qt) decreased with increasing the adsorbent dose, which was due to unsaturated sites of adsorbent through the adsorption process (23, 36). Based on the results of this study, the NOM adsorption capacity of SMZ3 (qm) was 111.23 mg/g, which is comparable with other adsorbents such as activated carbon from rice husk (45.4 mg/g) (37), crosslinked chitosan-epichlorohydrin beads (44.84 mg/g) (18), fly ash (10.7 mg/g) (17), aminopropyl functionalized SBA-15 (117.6 mg/g) (38), polypyrrole-coated glass beads (0.396 mg/g) (39), and aminated polyacrylonitrile fibers (16.22 mg/g) (40). The results showed that SMZ can be used as low-cost adsorbent for the adsorption of NOM from aqueous solutions. The adsorption of NOM by SMZ enhanced at acidic pH levels. Results from this study indicated that SDS-modified natural zeolite with a surfactant bilayer coverage was a favorable adsorbent for the removal of NOM from aqueous solutions. The equilibrium data fitted well with Langmuir isotherm. The maximum adsorption capacity of SMZ with surfactant bilayer coverage for NOM was 111 mg/g at 25°C and pH = 5. The authors would like to appreciate the financial support of the deputy of research, Tehran university of medical sciences. Authors’ Contribution: Amir Hosein Mahvi, Mehdi Vosoughi, , Mohammad Javad Mohammadi, Bayram Hashemzadeh, Anvar Asadi, Amir Zahedi, Soudabeh Pourfadakar.